Walking 35km to help people affected by mitochondrial disease (mito) is an incredible thing to do - THANK YOU! 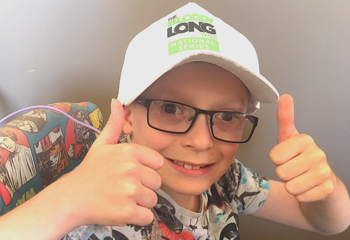 To help you make every step count we’ve come up with 8 top tips to make it easy to reach and exceed your fundraising goal - and bring us a step closer to a world without mito. The money YOU raise will support people affected by mito and help find cures for those suffering from this devastating disease. So what are you waiting for? We’ve found that donating to your own page first really does motivate others to follow suit! People will often match the amount you donate so set the bar as high as you can and watch the donations roll in. Social media platforms, like Facebook, are the perfect way to let your friends know about your challenge on a regular basis. You can show them how your training is going by posting your training results via mapmyfitness. It’s a GREAT way to remind them that this is not only a fitness challenge, but also one that has a huge role in supporting the mito community and finding cures. Let people know why you’re supporting the cause and taking on a personal challenge. 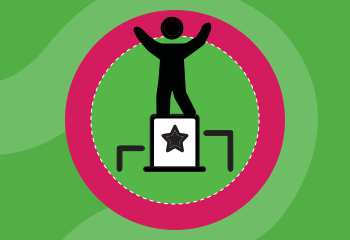 Your loved ones are really giving in support of you, so make sure your Supporter page is updated with your photograph and any training milestones you’ve reached so far. Why not send an email to your friends, family and colleagues to let them know about your upcoming challenge and ask for their help? People are often willing to give…they just need to be asked! Make it easy for them by including a link directly to your fundraising page. Does your company offer a dollar matching program? You could double the impact of each gift your workmates donate, or even your whole fundraising total. Speak with your manager to see if this is something your company offers and get matching! Where? Everywhere! 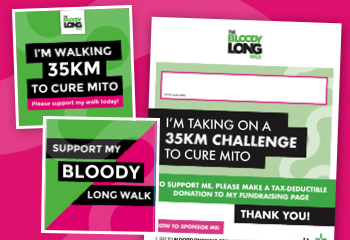 Promote your Bloody Long Walk challenge at work, school or local community group. Ask if you can put up a poster or two to spread the word! You can also post a thank you message on your fundraising page to let the world know how grateful you are for their support. We know how easy it is to miss a post or to forget what we were going to do! Sharing your fundraising page on social media a few times in the lead up to the walk is a great (gentle) reminder that you are going to take on 35kms for a great cause!